← Y2K: Genuine Crisis or Over-Hyped Circus? Last week I went on the record that Kim Davis should have resigned rather than go to jail. Lots of Christians disagree with me. Mike Huckabee disagrees with me. Some have even compared her stand with Martin Luther King’s decision to go to jail during the Montgomery Bus Boycott. Other people however have seized on Davis’ marital situation that reads a lot like the woman at the well in John 4. Davis has been married four times and had at least one extra marital affair which resulted in children. Is Davis a hypocrite for defending traditional marriage given her history of making a mockery of it? Many have commented on the fact that Davis herself has been divorced several times. As a strategic matter, this makes her a rather poor poster child for “traditional Christian marriage”: Jesus himself treats divorce and remarriage as akin to adultery. But the point is not merely ad hominem: Davis’s willingness to impose a standard of marriage on gays that she does not apply to others, herself included, shows that she’s less interested in enforcing a consistent traditional Christian view than in singling out gays for disapproval. I’ve interviewed John Corvino on the radio and he is a nice guy and way out of my league as a philosopher. John would be the first to admit as a philosopher none of that is relevant to whether he is right or wrong about Davis or Jesus. I agree that Davis isn’t the poster child for traditional marriage. But the question isn’t about whether she’s a good example but rather whether she is playacting at supporting marriage by the authority of God. Of course, you can anticipate the objection: but if she became a Christian1 after this serial monogamy, she is forgiven. That is her past. She’s only a hypocrite if she prevents gays from getting married because of how sacred she holds marriage as a Christian and now were to commit adultery. In another column, Corvino disagrees and quotes the Gospel of Mark to prove it. “Whoever divorces his wife and marries another commits adultery against her; and if she divorces her husband and marries another, she commits adultery” (Mark 10: 11-12). Notice that, in Jesus’ words, divorced and remarried people are not people who did sin (past tense) and then had their slate wiped clean. They are people who are sinning, as persistent and unrepentant adulterers. Why isn’t there “grave danger in that”? Is this a contradiction? Not really when you consider that Jesus’ audience already assumed the exception for divorce. Jesus mentions the exception in Matthew because he is weighing in on a debate about what conditions is it acceptable to divorce not whether anyone can divorce at all. Some Rabbis thought it was okay to divorce for nearly any reason. Others thought divorce was mandatory for adultery. I think we can assume Jesus is working within Moses’ tradition though he wants to point to the importance and sanctity of marriage in his new kind of living he calls The Kingdom of Heaven. What’s interesting is that Moses implies in Deuteronomy 24 that when a divorce is granted, the person is not still married in the eyes of God. If she was, then she could simply go back to her first husband in order to keep from living in sin. If she is divorced from her second husband or he dies, she is not still married to her first husband. She would have to marry him again. Moses says that is something she should not do (Deuteronomy 24:2-4). This implies that she is not still married in the eyes of God to the first man. So if Davis isn’t a hypocrite because she’s committing adultery with her present husband, then is she a hypocrite at all? I have no idea and neither do you. All we have is her testimony. That’s why Davis is such a heroine to the religious right. There is nothing in your past that can disqualify you once you have repented. All your sins are wiped clean. In fact, that Davis once violated the sanctity of marriage with abandon actually makes her even a better heroine in the eyes of conservative Christians. She’s seen the light, proving that nothing is impossible if you only believe. But for the world that Davis inhabits, it’s just another contradiction to sweep away. Her past doesn’t count against her because she is forgiven, no matter how much damage she has done. Imagine you are one of the early church’s first members. You are sitting in a home with a few other believers, sharing a meal. You pray together. You sing a few Psalms. Someone recites a bit he’s heard of Jesus’ biography. Then someone gets up to read a letter to you from some guy named Paul. Paul is a guy who used to go by the name Saul. It’s possible he is responsible for the murder of someone you know, perhaps even your parents or one of your children. Now you have to sit and listen to someone read not just words from this guy, but instructions from this guy. Since his conversion from Christ-hating enforcer of the Law to card-carrying Jesus freak, he’s not just one of your fellow Christians. He’s an authority over all Christians recognized by nearly everyone. And yet Paul is not accused of hypocrisy because of what happened before his conversion. Am I comparing Kim Davis to Paul? Not by a long shot. I recently heard that Davis’ Apostolic Church denies the trinity so she believes a Christian heresy (Modalism). However, she’s not a hypocrite by Christian standards just because she used to be a serial monogamist. While I agree with points of your article I do not agree with calling Kim Davis a Christian. She is Not. Please read this article. Thanks! Is Kim Davis a Christian and Does the Trinity Matter? I appreciate your raising this. We did mention that in note 1 and in the last paragraph but were focused on other issues in this particular post. I am a Pastor, and remarried. I would like to point out first that divorce is permitted in the case of infidelity as pointed out in Mathew. My former wife was unfaithful 5 times and I don’t believe He intended me to stay married under those conditions. I did not remarry/marry until my former wife remarried, and again it was 5 years later. Now Mark 10:9 also states, “What therefore God hath joined together…”; my first marriage was not joined by God, because at the time I was an atheist and was not married under God. Yes of course God existed at the time I was married, but I did not acknowledge His existence. My remarriage/marriage was under God, and both of us were/are saved Christians. It is like comparing a Jewish convert; God declares Israel(Jews) are His chosen people, but just because your Jewish doesn’t mean you have a free pass to heaven, you must acknowledge Christ as your Savior in order to have everlasting life, an unconverted Jew is going to hell. 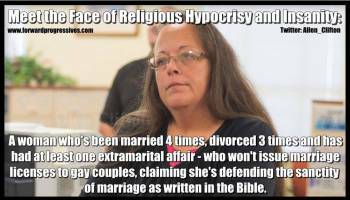 Kim Davis also issued marriage licenses to couples that were living together and committing fornication prior to marriage, yet she didn’t ask or deny a license on that basis either, so yes she would be a hypocrite. To finish, one transgression of the law makes you guilty of all, to paraphrase Galatians 5, If you are a debtor to do the whole law Christ is no effect unto you, whosoever is justified by the law; ye are fallen from Grace” we are saved by Grace, through faith, not by law. the issue should be her not being forced out of her job , because of this issue , and the implications , to all who would run for gov jobs . how about you , would you feel welcome to run ,if you knew you were required to compromise your conscience. AND DOES THIS ISSUE ENCOURAGE YOU TO RUN . ?